Some people look to vehicles as something powerful that they can have control over. This is what the 2019 Nissan Armada has to offer the drivers with the engine and the wheel drive. We at Sheehy Nissan of White Marsh are happy with the amount of features that come together in order to bring you the performance that is very trustworthy for a vehicle. The 2019 Armada has a towing capacity of 8,500 lbs thanks to the 5.6L Endurance V8 engine that offers 390 horsepower and 394 torque for a powerful performance and responsive handling on various road conditions and terrains. 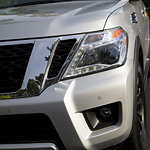 Another good feature of the Nissan Armada is the ability to take off-road trails. The Nissan Armada is an example of the intelligence that goes into the design of a vehicle with the purpose of bringing forth something that is going to make driving a fun and enjoyable experience for the driver and passenger.